We made this a two day event with a car show and driver meetup on Friday evening and a car show and tailgate tied to the Wake Forest University football home opener versus Towson State University on Saturday. For Friday evening, we had 10 owner vehicles and 13 dealer/OEM provided vehicles with a great variety of plug-in vehicles. Attendance was approximately 30 people and was mainly those who were EV owners and enthusiasts. There were approximately 12 vehicle test drives given to a few that were considering becoming a new owner, existing owner getting ready to switch vehicles and some just wanting to try something different for the experience. The NC Clean Energy Technology Center was the football game sponsor for Saturday which gave us tremendous exposure through pre-game promotion channels of social media, websites, radio and tv promotion. There was a 30 second video played (more than once) on the stadium media screen that included EVs and HEVs. In addition, during my pre-game radio interview NDEW was mentioned. There were a number of radio blurbs throughout the game promoting NDEW, EVs and PHEVs. Estimated participation in the pre-game car show was 1,500 people with 13 dealer/OEm provided vehicles. The official game attendance was 23,619. All in attendance were exposed to EVs through during game announcments and the 30 second video. I am not sure of radio listener audience or IMG TV audience, but it is likely that another 20,000 to 25,000 were reached through the event. 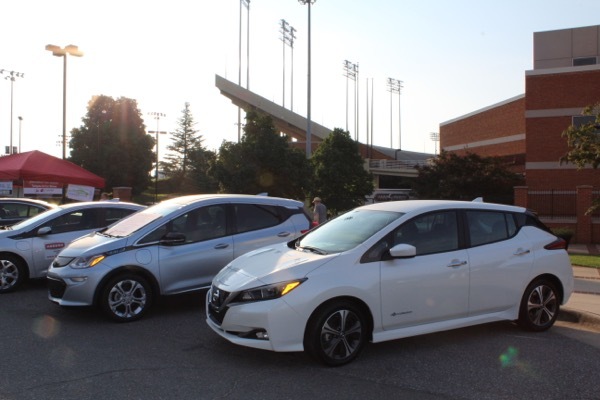 Four of the 13 EVs and PHEVs for NDEW Kickoff Car Show Line-Up at BB&T Field Gates for the Wake Forest Football Home Opener--shown from right to left Nissan Leaf, Chevrolet Bolt, Chevrolet Volt and BMW E5-Series. Please join the NC Clean Energy Technology Center for an electric vehicle demonstration and tailgate for the Wake Forest University versus Towson State University football game weekend to kick off National Drive Electric Week. Plug-in electric vehicles will be showcased. There will be a car show and driver meet-up on Friday afternoon, September 7th, from 5:30p to 7:30p. For game day, September 8th, there will be an electric vehicle show from 10:00a to 12:00p. (Kick-off is at 12:00p.) Come see and learn more about driving with electricity. Also, learn about how you can own one. The car show and meet-up on Friday will be open to the public. For game day on Saturday, unless you have a parking pass and tickets to the game, it might be best to avoid the traffic and crowds. Both events will be held outside Bridger Field House at the north end zone of BB&T Field. Game day at BB&T Field attracts more than 35,000 fans and support staff. The event will be featured on the Demon Deacon Football Game Day site and promoted by Demon Deacon Social Media. This will be a fun event that generates lots of exposure to the availability and capabilities of electric vehicles. Registered attendees report 141,900 electric miles driven.